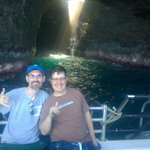 It's been more than a month since we got back from our two week vacation in Hawaii, and things have been so busy I just now finished posting our pictures. So - here they are! On the plane I read a bunch and watched Spike Jonze's movie "Her" which was pretty good! After getting off the plane, we stopped at a Starbucks and then made our way down to baggage claim. 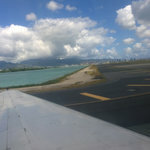 I forgot how big the Honolulu airport was - it was a solid 10 minutes of walking to get there. Then our luggage took 20 more minutes to show up, although we were thankful to see it hadn't been lost! 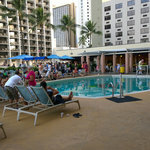 We had a shuttle take us to our hotel, the Aston Waikiki Beach, which is on the very east end of Waikiki Beach. 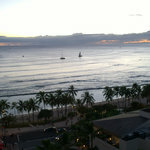 We got settled in and took the requisite pictures of Waikiki Beach from our room, then walked around for a bit, then came back to the room and collapsed, having stayed up long enough to get on a semi-reasonable schedule. Since activities tend to start early here we decided that getting up early and going to bed early would be our schedule... we'll see if we can stick to it. This morning was the Pleasant Holidays orientation thing where you can schedule events for the rest of your trip. It's helpful to do this all at once (and they have everything pretty well organized), but sitting through the presentation I can see why we overscheduled ourselves last time we were here. There's not pressure, exactly, but the guy kept going on and on about how much amazing stuff there is to do here. Which is true! But trying to fill every minute of every day with tours and museums and shopping is not the way to have a vacation, or at least it isn't for us. Anyway, we booked a few things (and got a sweet tote bag!) and then walked back to our hotel. The orientation was early enough (we got picked up at our hotel at 7:30) so we read down by the hotel pool for a bit, then walked down to a beachside café we had seen and after reading some more, ate lunch there. Then back to the room and we went downstairs to get picked up by a shuttle to go to our Atlantis Submarine tour, which I was really excited about! Then we got there, walked to the boat that would take us to the submarine, and after 15 minutes or so they came out and announced it was cancelled due to poor visibility. (something about ocean currents). I was fairly bummed out by this, especially since we didn't have a free slot to reschedule to. So, back on the shuttle to the hotel. It's actually pretty hot here - the highs are supposedly around 90 but in the sun it's really quite warm. I drank a lot today but suspect I didn't drink enough. I think we're going to try to limit outdoor activity between noon and 4 pm, or at least try to do things in the shade! Afterwards we took another bus over to Hilo Hattie, which is a pretty famous souvenir store. They're very friendly there and only somewhat pushy :-) I bought a nice Hawaiian shirt and a few other odds and ends, and then we took their shuttle back to our hotel to crash for a while. 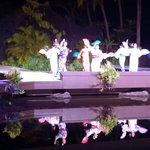 We had dinner reservations at a show called The Magic of Polynesia. Whilst there, I ordered "The Magic", which is a drink served in a volcano cup that comes out on fire. Our waitress said that the top was 151 (it was in a hollowed-out lime half), and I could drink it as a shot or pour it in the drink. I guess I don't understand how fire works, because I blew on it a few times and it didn't go out. So I decided that that was just how it worked, and I'm not brave enough to drink a flaming drink, so I picked up the lime half and poured the fire into my cup. Unfortunately I spilled a bit and then the tablecloth and my napkin were on fire. _Then_ I figured out that the secret is: blow harder and the fire will disappear, although not before leaving a hole in my napkin and burning my finger. The Japanese tourists sitting next to us were quite amused. Lesson learned! The food and show were pretty good... as our guidebook said, the magic was somewhat repetitive, but there was one trick that honest-to-goodness made me gasp. (he levitated a woman, raised her up to the ceiling, and then she disappeared and a bunch of paper exploded outwards. It was impressive!). Interestingly, one of the early things he did was ask where everyone was from, and there was a good chunk of people from the US, Japan, China, Korea, and Australia. (and two people from Canada, who got made fun of, because Canada!). Later in the show he picked an older Japanese guy to be his assistant and verify that the wooden box was solid, etc. Unfortunately, the guy didn't really speak English, and after a few questions the magician started leading him on to say "OK" to everything. At one point he tried to get in the box with someone else, which was definitely not part of the trick! Then after it was done he walked behind the curtain to follow someone, also not intended. The guy did seem to be a good sport about it, though. 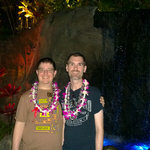 Today started auspiciously - our ride to the Polynesian Cultural Center wasn't until 10:30, so we slept in a tiny bit, grabbed breakfast by the pool (it even rained for a few minutes! ), and then read by the beach for a bit before heading over to the Marriott where we were supposed to be picked up. Right around 10:30 a bus marked PCC showed up, but the driver looked at our ticket and said we were supposed to be on another bus. 10:30 became 10:40 became 10:50, and we were the only one left waiting - never a good sign! So I called Pleasant Holidays and after waiting on hold a while, someone confirmed we had indeed missed it somehow, and booked us on the next bus leaving at 12:30. I asked for a confirmation number and then something happened and she basically hung up, I guess. Since we knew we had extra time we decided to go to the Pleasant Holidays booth at our hotel to try to get firmer info. Luckily Nancy at the booth took very good care of us and we even got a partial refund, which was nice because this new plan significantly cut down on the time we're we'd have at the Center. The PCC itself is pretty cool, though - we walked through all 6 islands it covers (although we couldn't stay long at any of them; supposedly it would take 16 hours to see everything), had delicious luau food, then saw a pretty impressive show they call Ha: The Breath of Life. The show was very high-energy with lots of running around, yelling, and intense dancing. (the fire dancers were the coolest!) 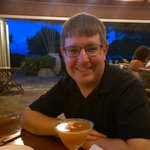 Many of the people that work at the Center are students at BYU Hawaii, and while they're limited to working 19 hours a week, I can't imagine performing in that show 4 nights a week for months on top of schoolwork! 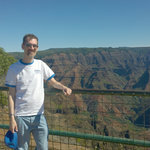 Today we had a tour of the Dole Pineapple Plantation and north Shore and a few other random things. We were supposed to be picked up at 8:15 - when 8:20 rolled around I nervously called the company (fool me once, shame on you...) but the bus was just running behind. Our driver this time was friendly, funny, but also very knowledgeable. She also earned a bunch of points in my book by making fun of the other drivers (like the one yesterday!) who make you say "aloooohaa!" (to the cadence of "Helllloooooooo nurse!") 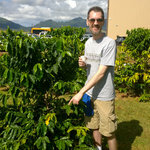 The tour was a lot of fun - we saw some cool stuff at the Dole Plantation, including the world's largest maze! David and I ran a little short on time but we did manage to hit 5 of the 8 hidden stations. I also tried some "Dole Whip" which is kinda like soft-serve pineapple, and was delicious! 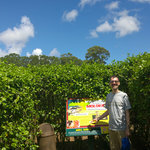 <- "breakfast on the beach"
<- David in the hedge maze! We drove by a lot of pretty places and I took pictures of varying quality. The trip ran a little late so we only had time for a short nap before dinner. 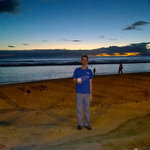 We walked to a Japanese udon noodle place, which was pretty good, then walked along Waikiki beach for a bit after dark. 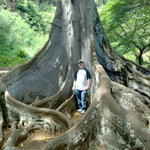 <- Kualoa Ranch, where Jurassic Park (among other films) was filmed! 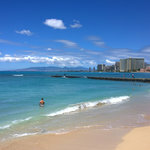 This is our last night on Oahu - it's been nice here but I'm also looking forward to a quieter island; Waikiki is quite crowded! Our hotel has been pretty nice - one particularly cool feature is the newfangled elevators. In the elevator lobby, you have to tap your room key to the panel and then type in the floor you want to go to, and then it tells you which elevator (A-E) to go to. The elevator then has no floor buttons, although it does indicate which floors it's going to. I've heard of this idea before - it lets the elevator group trips more efficiently - but never gotten to use it in practice. I never saw anyone being confused (although walking into an elevator and not pressing a button is still weird! ), probably because there were signs everywhere and it was carefully explained to us when we checked in. Breakfast, then reading by the beach, then leaving for the airport was our morning. 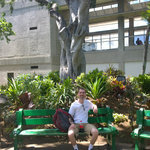 The Honolulu airport was a bit crowded but we got through security with plenty of time before our flight. It's a nice place to spend time since it's open-air in parts, and the weather was nice like it usually is :-). 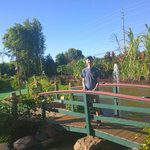 There's even a garden we went down to explore! 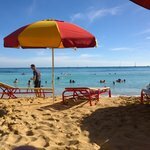 Had lunch and took the absurdly short flight to Kauai, got our rental car, and drove up to our condo - the Outrigger Waipouli Beach Resort. 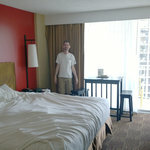 Our condo is really nice! Lots of space and a full kitchen. We lollygagged around for too long to take pictures before nightfall, but we'll take some tomorrow. Met up with Jonathan and Sarah (who did _not_ die!) and we went out to a Benihana-style place for dinner, which was excellent. 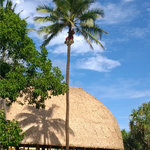 Then we stopped by the local Goodland to buy breakfast food and laundry detergent (and chocolate-covered macadamia nuts! ), and back here to relax for the evening. 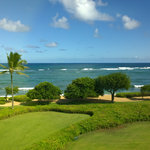 <- the view from our condo in Kauai! 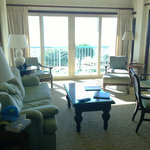 We had breakfast on our lanai this morning, which was very nice! 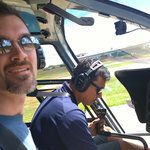 After lounging around a bit we headed back to the airport for our helicopter tour with Blue Hawaiian. We enjoyed our flight with them on Maui, so we decided to use them again. This time we got to ride in the front seats (I got to be next to the emergency exit! ), which gave us even nicer views. 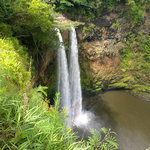 We saw lots of cool stuff including Manawaiopuna Falls (the waterfall seen in Jurassic Park! 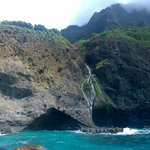 ), the Kalalau Beach (which Jonathan and Sarah had hiked to), and the Na Pali coast. Hopefully some of my pictures will turn out OK! Afterwards we drove up to Kapaa for lunch at a local burger place, which was good, then back to the condo for rest time. 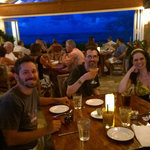 Later the four of us went down to Hanapepe for an art night they have every Friday evening. There were food trucks and people playing music and a surprising number of art galleries open for such a small town! The nicest art gallery we saw was Giorgio's...unfortunately it was all pretty expensive. Someday! 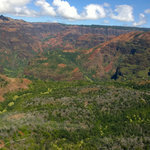 Tomorrow we're planning to hike part of Waimea Canyon, which should be fun but possibly exhausting. <- in the front seats of the helicopter! 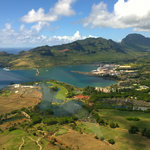 <- a bay in Lihue? 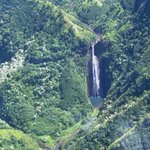 <- the waterfall in Jurassic Park! 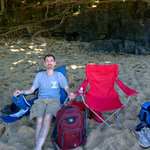 <- Kalalau Beach, where Jonathan and Sarah hiked to! 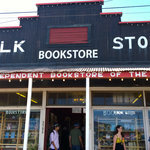 <- us in front of the westernmost bookstore in the US! 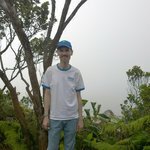 <- David in front of creepy fog! Well, something happened last night and my allergies started acting up. 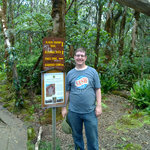 (not sure if I was allergic to something on the hike or what?). Apparently I snored (sorry David!) which I rarely do unless I'm seriously congested, so I woke up feeling fairy crappy this morning. Luckily Tylenol+real Sudafed+caffeine+cough drops have been helping a bunch. 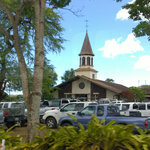 Today was set aside as a beach day so we went up to Hanalei for lunch and then to Hideaways Beach in Princeville. The hike down to the beach was surprisingly tough/scary, but the beach itself was beautiful, albeit small. I took a bunch of pictures and we hung out and read for hours. It was great! Afterwards we came back to the condo and enjoyed the salt-water pool - it has two water slides, a lazy river part, three waterfalls, and two spas! Thankfully feeling somewhat better today. We didn't have anything scheduled in the morning so after taking care of a few odds and ends we went down to the beach by our hotel. It's nice because there are some trees around so there was shade we could follow. There was a guy sunbathing near us who was friendly but, once he surmised we were a couple, proceeded to go waaaaay beyond the limits of oversharing. Way beyond! 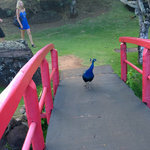 <- click for wedding ceremony pictures if you missed them above! 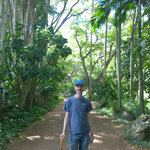 This morning we toured the Allerton Gardens at the National Tropical Botanical Gardens. The tour started out in a not-promising fashion, as our guide seemed knowledgeable but also kind of weirdly goofy and rambly. Luckily once we actually got into the garden itself things picked up, and the tour was pleasant, if a bit hot by the end. 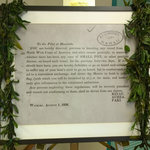 The story of how the garden was founded is pretty weird. Samuel Allerton made his wealth, apparently, by getting an inside tip that there was going to be a meat shortage, so he bought a bunch of cattle for 1 cent a pound and later sold it to the government for 60 cents a pound. (so, you know, profiteering!). Apparently he also founded a bank that became JP Morgan Chase? Anyway, his son Robert Allerton wanted to be an artist, so he went to art school, but then didn't like it and was contemplating suicide. So instead his father bought him some land and he designed the gardens there, which I guess he really liked. I guess the lesson is: money is useful? 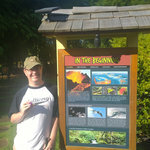 So the gardens were nice and we did get to see where they found the raptor eggs in Jurassic Park, so that's something! Afterwards we came back to the condo for a bit and then went up to Kauai Mini Golf, which doubles as a botanical garden. (and was apparently started by the founder of E*Trade!). It was a good time. <- where they found the raptor eggs in Jurassic Park! This morning we slept in (yaaaay!) 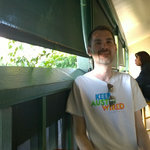 and then had brunch at Kountry Kitchen, which I thought >was pretty good, although David was less impressed with his meal. We later met up with Jonathan and Sarah and got some shaved ice and then went over to the Kilohana Plantation. 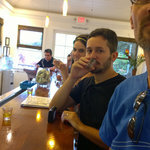 We looked at some shops and then did a rum tasting of Koloa Rum, which is made nearby. 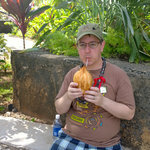 It's good rum, especially the coconut rum! 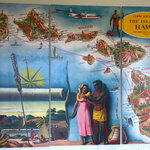 Afterwards we popped over to do some more shopping (where I saw a $750 map of Hawaii I liked, but didn't buy) and then back to Gaylord's Restaurant at Kilohana Plantation. Today was the first day we didn't have to put on sunscreen, and I have to say it was pretty awesome. I'm getting tired of having the sun being our sworn enemy and having to lather on sunscreen every time we go outside. To its credit, I have been mostly free of sunburns this trip, but it's a pain! Quiet morning, although we did manage to squeeze in some beach time, then it was off to the North Shore for a Na Pali Coast boat ride and snorkel! We went with the Sea Breeze tour, and the boat was nice if a wee bit crowded. 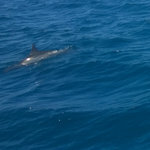 We saw some dolphins early on which was nice, and then some magnificent views of the Na Pali Coast, including some of the Kalalau Trail that Jonathan and Sarah recognized. Unfortunately I can't wear my glasses while snorkeling (it messes up the seal on the mask), but I did come almost face-to-face with a turtle! The water was a bit choppy and I started to feel a little sick on the way back, luckily nothing came of it. Afterwards we came back to shower and ate dinner at the restaurant at the condo, which was quite nice. Then David and I looked at stars on the beach :-) before coming back to pack up and whatnot. Last day in Hawaii! :-( Our flight didn't leave until the evening, so after reading on the beach by our condo for a bit, we checked out and went to the coffee place we liked in Kalaheo for lunch, then went by a few waterfalls, played another round of mini golf, and went back to Lihue for dinner. The airport was kind of warm and they had some live music which was nice but a bit loud. 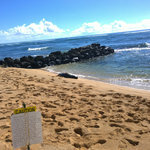 <- monk seal on the beach!